Long before the Europeans arrived on Easter Island in 1722, the native Polynesian culture known as Rapa Nui showed signs of demographic decline. However, the catalyst has long been debated in the scientific community. Was environmental degradation the cause, or could a political revolution or an epidemic of disease be to blame? 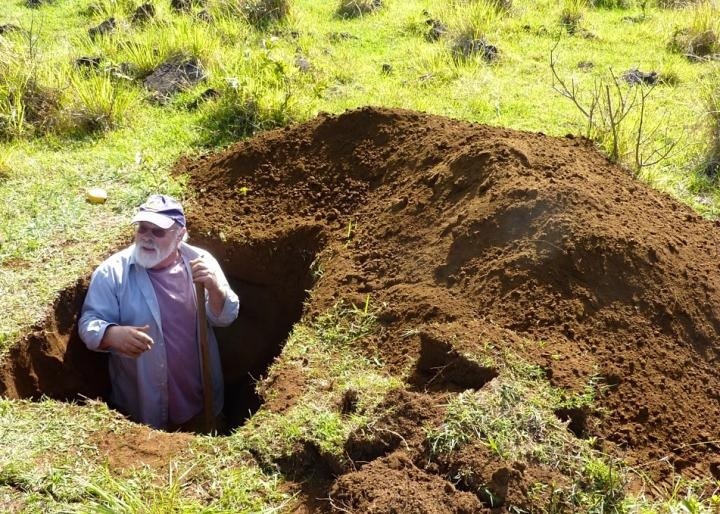 Oliver Chadwick, a professor in UCSB’s Department of Geography and Environmental Studies Program, takes soil samples from one of three study sites on Easter Island. A new study by a group of international researchers, including UC Santa Barbara’s Oliver Chadwick, offers a different explanation and helps to clarify the chronological framework. The investigators expected to find that changes coincided with the arrival of the Europeans, but their work shows instead that the demise of the Rapa Nui culture began prior to that. Their findings are published in the Proceedings of the National Academy of Sciences. Chadwick joined archaeologists Christopher Stevenson of Virginia Commonwealth University, Cedric Puleston of UC Davis and Thegn Ladefoged of the University of Auckland in examining six agriculture sites used by the island’s statue-building inhabitants. Their research focused mainly on the three sites for which they had information on climate, soil chemistry and land use trends as determined by an analysis of obsidian spear points. The team used flakes of obsidian, a natural glass, as a dating tool. Measuring the amount of water that had penetrated the obsidian’s surface allowed them to gauge how long it had been exposed and to determine its age. The study sites reflected the environmental diversity of the 63-square-mile island situated nearly 2,300 miles off the west coast of Chile. The soil nutrient supply on Easter Island is less than that of the younger Hawaiian Islands, which were also settled by the Polynesians around the same time, 1200 A.D. The first site the researchers analyzed was near the northwest coast. Lying in the rain shadow of a volcano, it had low rainfall and relatively high soil nutrient availability. The second study site, on the interior side of the volcanic mountain, experienced high rainfall but had a low nutrient supply; the third, another near-coastal are in the northeast, was characterized by intermediate amounts of rainfall and relatively high soil nutrients. These results suggest that the Rapa Nui reacted to regional variations and natural environmental barriers to producing sufficient crops rather than degrading the environment themselves. In the nutrient-rich center where they could produce food well, they were able to maintain a viable culture even under the threat of external factors, including European diseases such as smallpox, syphilis and tuberculosis.